"I remember when everyone was worried about Russia doing this and Cuba doing that and us all getting blown up, and everyone in Alabama was worried about being integrated. It's a sad thing, isn't it? After we went to school together, we found out there wasn't much difference in none of us. We were all struggling just as hard to buy groceries as they was, they was all wanting bicycles for Christmas just like we was." Addie Mae Collins, Denise McNair, Carole Robertson, and Cynthia Wesley were simply behaving as children often do, on Sunday the fifteenth of September in 1963. After attending their Sunday school classes, the four girls took residence in a lower level lounge where they played and made themselves presentable for the impending sermon. Sadly the four never made it to the sermon as a bomb ripped trough the basement of their church and ended their lives. Regarded as perhaps one of the most heinous hate crime acts in American history, the church bombing in Birmingham has effects and consequences that ripple even today, the most stunning of which is that there still remains a handful of suspects at large. Originally published in Texas Monthly magazine in April of 2000 (you can read the original story here) the story of Bobby Cherry (Jenkins) and Tom Cherry (Sizemore) goes beyond that of a typical father and son discord. Accused of being one of the key planners in the original bombing, Bobby fled Birmingham after the death of his wife years after the bombing took place and abandoned his seven children in an orphanage. Years later, his oldest son, Tom, would seek out his father and eventually come to live with him in a desolate part of Texas. With the help of a kind stranger named Gerrick (Rhames), as well as a dedicated FBI agent (Feore), Tom begins to see that his father is not the man he admired as a child but, in his eyes, is a staunch racist—a truly violent and evil person. Told partly in present day Texas, as well as flashbacks through the eyes of Tom as a child, Sins of the Father has the potential to be a hard-hitting and emotional look at lives affected by racism and segregation in the South so many years later. Instead, the film becomes bogged down by a series of sub plots that distract from the emotional impact offered by the central story. The relationship between Tom and Gerrick serves no real purpose in terms of moving the plot forward; instead, it seems added only to show Tom's ability to bond with a man of another color. I find it frustrating that a film focusing on the divides that spread across a family hampered by racism feels the need to offer an African-American character used only for the purpose of showing the expanding emotion of the central character. A smarter script would have made the character of Gerrick central to the plot rather than a bystander. With that small exception, Sins of the Father is a well made effort from director Robert Dornhelm. Dornhelm offers an unflinching portrait of a father and son brought together by family but torn apart by differences. The scenes between Tom and Bobby have, at times, an electricity in them that is often lacking in other films set along the same lines, that of a troubled familial relationship. At its heart, the conflict between Tom and his father deals with Tom's disbelief that a man he regarded in such high esteem for so long is in fact capable of doing horrible things. Dornhelm and screenwriter John Pielmeier do a fine job of showing Tom's emotion and high regard for his father crumble bit by bit. There are times where I found myself wishing that the relationship between Tom and Bobby had its residence in a better film. Though there are several supporting actors and actresses, the performances by Sizemore and Jenkins are central to the success of the cast. Sizemore, an actor I have always admired, proves himself to be qualified with a performance here that is at times quietly emotional and, at others, overflowing with anger. Sizemore does a fine job going between emotions in a performance that I hope will see recognition when awards season comes around. Jenkins (who most recently can be seen in the amazing Six Feet Under) is also very good in his role as the jaded, anger-filled, old man who sees his future quickly fading away. There are moments where a simple expression on his face says more than words, especially during a funeral scene late in the film. Rhames and the underrated Colm Feore are each good, but underused in their roles. 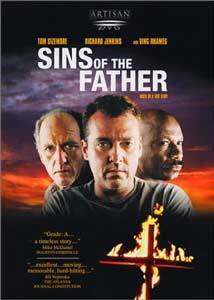 Image Transfer Review: Presented in both a 1.85:1 anamorphic widescreen image as well as a slightly cropped, full-frame transfer, the video portion for Sins of the Father is a mixed bag. Several scenes show terrific detail and sharpness, including those set in desolate locations. The fleshtones, at times, look a bit off; this is a minor problem but it is still evident. The largest flaw comes at the start of the film, when the church is blown up, featuring pieces of the stained glass window flying through the air—they just look horrible. There is excessive grain and the image looks incredibly soft. Thankfully, the image rights itself and does a nice job from there on. Audio Transfer Review: A Dolby Digital 5.1 mix is offered, though it is largely uneventful. Dialogue sounds fine throughout as it is clean and free of any sort of flaws. The surround speakers are used largely to reproduce the score and other ambient sounds, thought he opening scenes of the church members signing and the subsequent explosion showcase the mix as the sounds of the lush score envelop the room. A Dolby Surround channel is also offered though the differences between the Dolby Surround and its Digital counterpart are slight at best. Extras Review: The original trailer for Sins of the Father is offered in full-frame with Dolby Surround, but watching it first gives away a large portion of the film. Trailers for other Artisan releases are also offered and those include Novocaine, Dune, and The Rambo Trilogy. I would have been pleased with perhaps a documentary on the actual events that transpired, which were the basis for this film, but sadly there is nothing here for those looking to learn more about the Birmingham bombing. Information about the attack as well as the manhunt by the FBI for those believed to have been involved can be found at numerous locations on both the Internet and in other media forms. For a film dealing with the horrible events that transpired in Birmingham in 1963 you would be better off checking out Spike Lee's brilliant Four Little Girls but there is enough about Sins Of the Father for me to give it a mild recommendation. It isn't groundbreaking work but the performances and emotional backbone of the father and son relationship rival several films that I have seen recently.